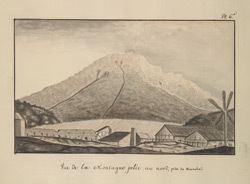 Sketch of Mount Pelée on the island of Martinique. The mountain is approximately 4,500 feet high and is volcanic. It was affectionately known as 'La Montagne' by islanders who believed that it was one of the safest places to live due to the protection the mountain gave from the strong winds and storms. Pelée literally translated means 'the bald one'- a reference to the fact that the slopes are bare at its peak. This sketch was drawn by Alexandre Moreau de Jonnès (1778-1870), an officer in the French Navy stationed on the island in the early 1800s.